This exquisitely hand crafted brush allows you to apply your blush with ease. Simply follow the contours, adding bronzer or blush to the temples, cheeks and forehead to create the illusion of depth. This brush also acts as a stunning highlighting tool, helping to accentuate whichever feature you desire. 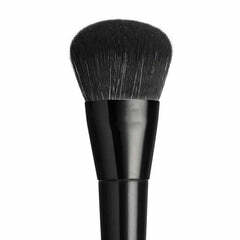 The brush also features soft cruelty-free bristles for an air light touch on your skin. 21cm full length. Bristles - 3.4cm high, and 3cm wide.